The literature review and environmental scan sources included peer-reviewed scientific and academic articles and the grey literature. 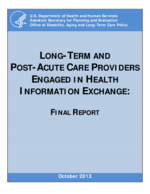 Sources included trade journals, reports from the public and private sectors, and other identified material relevant to health information technology (HIT) and health information exchange (HIE) in long-term and post-acute care (LTPAC)/long-term services and supports (LTSS) settings, transitions of care, care coordination and longitudinal care plans for persons who receive LTPAC/LTSS services, and interventions to reduce hospital readmissions and medication errors in this population. 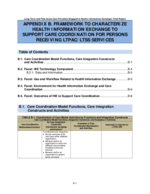 Care coordination and care transitions literature was also reviewed to identify effective models of care and the role of information sharing and exchange. Sources for published articles were PubMed, Google Scholar, and the International Medical Informatics Association Inventory of HIT Evaluation Studies and Systematic Reviews (http://evaldb.umit.at). The inclusion criteria included studies based in the United States from 2007 and later. References from the most relevant articles were also reviewed to identify any important published articles that were not identified from the targeted search. Search terms included "Health Information Exchange" plus other terms including, but not limited to: "Care Coordination," "Care Transitions," "Long-Term Care," Long-Term and Post-Acute Care," "Nursing Home," "Post-Acute Care," "Home Health," "Long-Term Support Services," "Hospice," "Care Transitions," "Hospital Readmissions," "Medication Management," "Medication Reconciliation," "Outcomes," and "Measures." Web sites of HIE organizations and participating health care systems with participating LTPAC providers such as Utah Health Information Network, HEALTHeLINK (Western New York), Secure Medical Records Transfer Network (Oklahoma), HealtheNet (Maine), Colorado Regional Health Information Organization, Delaware Health Information Network, and Maimonides Health Care System. Presentations on HIE and LTPAC providers available from the Internet (e.g., by Challenge grantees, Beacon communities). Materials provided by key informants and expert project advisors, including Michelle Dougherty from the American Health Information Management Association (AHIMA) and Dr. Larry Garber from Reliant Health, a LTPAC provider and a Challenge Grant recipient. The Office of the Assistant Secretary for Planning and Evaluation (ASPE) web site and ASPE-sponsored webinars (with AHIMA) on HIE and LTPAC. State, federal, and other web sites of initiatives and programs that support care coordination and transitions, such as the Standards and Interoperability (S&I) framework and workaround exchange to support care transitions and key S&I workgroup reports, models, use cases, and findings. Meaningful use criteria under the electronic health record Incentive Programs to support HIE for care transitions. Accountable care organization (ACO) model descriptions to improve care transitions and descriptions of funded ACOs. Centers for Medicare and Medicaid Services programs, rules, and funding initiatives that support new models of care including LTPAC, such as the Center for Medicare and Medicaid Innovation, Community-Based Care Transitions Program State Demonstrations to Integrate Care for Dual Eligible Individuals, and physician payment incentive programs. National Quality Forum reports related to care coordination and measures, including the Critical Paths Care Coordination project. Other federal, state, and community initiatives including the State Action on Avoidable Re-hospitalizations Initiative and initiatives undertaken by Quality Improvement Organizations. Metz K, Russell W. Improving transitions of care in LTPAC: An update from the Theme 2 Challenge Grant awardees. Washington, DC: ONC; 2013. Office of the National Coordinator for Health Information Technology. Update on the adoption of health information technology and related efforts to facilitate the electronic use and exchange of health information. Washington, DC: ONC; 2013. Arizona Strategic Enterprise Technology Office.Arizona health information exchange environmental scan: Long-term care. CFDA #93.719. Phoenix, AZ: Arizona Strategic Enterprise Technology; 2012. SOURCE: Descriptions of CCTP projects from CMS Innovations web site: http://innovation.cms.gov/initiatives/CCTP/CCTP-Site-Summaries.html. Hospitals, other LTPAC providers Yes, providers query patients they are treating for information in the HIE. Information obtained through the portal can be printed & incorporated into records. Types of data available: patient demographics, lab results, radiology reports, medication fill history, discharge summaries, H&Ps, operative notes, & consults. ENS notifies providers when 1 of their patients has an encounter at a MD hospital. Alerts are sent via a Direct secure message or HL7 into an EHR system. Visiting Nurse Service of NY (VNSNY) NYCLIX (RHIO), Bronx RHIO, BHIX, NYCHHIP, LIPIX Hospitals, EDs, community health centers, SNFs, pharmacies, clinical labs, diagnostic imaging centers, etc. VNSNY enrolls physicians to use web portal to: manage their patient list with VNSNY; see current clinical information on their medications & other data; & review, sign or change the POC & modifications. The Web Portal is useful for physicians who have patients in home care, but whose EMRs cannot yet support electronic exchange of data with VNSNY or through RHIOs. VNSNY: accepts eReferrals & face-to-face attestations; display wound images & other data forms; & adapt more tightly to smartphones. A VNSNY allows the physician to: Refer patients electronically from the EMR, automatically drawing patient data from the EMR & adding instructions for home care. Receive the POC electronically, review & approve or change it, return it to VNSNY & file it in the EMR. Send & receive clinical messages electronically to & from VNSNY, & file a copy of the exchange in the EMR. Referral & assessment for placement and/or services. Followup phone calls within 24-48 hours after transfer to ensure services are set up. Clinical, demographic & service information is communicated by hospital case managers & care coordinators to community providers (HHA, other HCBS). NOTES: This table reflects HIE interventions identified from an environmental scan and literature review and is not intended to represent all HIE interventions and activities. Information regarding these interventions was gathered from a variety of sources, including telephone and e-mail inquiries; web sites, public or requested reports; presentations; webinars; and meeting summaries. All of these interventions have some type of electronic HIE. NA means more information was not readily available at the time of this report. * AOD is Answers on Demand EHR software; PCC is Point Click Care EHR software. ** The UTF contains medication lists, advance directives, the patient's functional status such as activities of daily living (ADL) and instrumental ADL, treatment plans, and other data elements required by the next provider of care in order to seamless assume responsibility for the patient. CO=Colorado; CT=Connecticut; DE=Delaware; FL=Florida; IL=Illinois; IN=Indiana; KS=Kansas; KY=Kentucky; MA=Massachusetts; MD=Maryland; ME=Maine; MN=Minnesota; NY=New York; OH=Ohio; OK=Oklahoma; PA=Pennsylvania; RI=Rhode Island; TX=Texas; US=United States; UT=Utah; VT=Vermont. Preadmission assessment process to gather information to evaluate the patient for appropriateness of admission & obtain clinical, demographic & financial information for communication with care team. Referral for Community Services LTSS Care Coordinators assess patient needs, work with hospital discharge team, & identify HCBS that would assist the patient in a successful transition. Patient input on Community Services LTSS Care Coordinator obtains information from the patient on their discharge & HCBS plan/ preferences as well as past services utilized & successes. 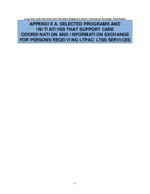 Transfer/ Admission to LTPAC Hospital or discharging organization provides information to transfer care to the LTPAC provider. Transfer to Hospital from LTPAC LTPAC organization transfers patient to hospital. Discharge from LTPAC to Another Provider LTPAC organization discharges patient to another health care provider (e.g., another LTPAC provider). 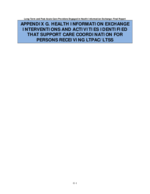 Discharge Information from LTPAC Provider to Patient When patient is discharging home or discontinuing home health services, the LTPAC provider develops a POC & instructions for the patient. 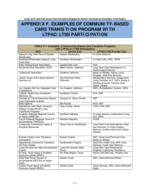 Discharge from LTPAC with Referral to Community Service Provider(s) For patients discharging from LTPAC who requires community services, the LTPAC provider may followup. ADT Event Data to HIE Network ADT message to HIE to communicate admissions & discharge information. HIEs may use these messages to notifying other treatment providers of an ADT. LTSS Care Coordinator followup with Community Service Provider & Patient LTSS care coordinator follows up with community provider to ensure services were started & assess progress. LTSS care coordinator follows up with patient/ caregiver to ensure services were delivered, assess progress, & determine if changes are required. Initial Assessments & Development of Admission Plan Nurse, therapist & other interdisciplinary team members assesses patient & develops & admission POC. Review hospital/ other provider records sent at transfer of care (paper printouts, scanned images on network drives). Nurse, therapist and/or other members of interdisciplinary team to Hospital/physician nurse or care managers. Coordination with physician at Start of Care including Medication Reconciliation & Orders, Evaluation/ Certification & Plan of Care Review admission transfer form & identify physician orders. Complete medications reconciliation of pre-hospital medication regime with post-hospital medications with attending physician to determine LTPAC plan. Develop POC (home care) & therapy evaluation/certification (SNF). Communicate Physician Orders & Medications to Pharmacy (SNF & hospice) Communicate admission orders & medications to pharmacy. Communicate orders for labs, radiology & special tests to service provider & return of test results Communicate lab, radiology & other specialized test orders to provider & return of results. Results delivered based on method established with provider via mail, fax, dedicated printer, through HIE, etc. Admission Physician Visits/ Evaluation (SNF) Attending physician and/or NP visit nursing facility patient after admission (within 3o days or more frequently as determined by organization protocol & patient condition). Request for additional medical record information from hospital to assist with admission assessment & care planning process LTPAC interdisciplinary team request additional information from hospital to complete an assessment. Request based on what was not available & sent at time of transfer. Information requested may include the discharge summary, operative report, final lab results, special assessments/ evaluations. Create & Maintain Patient's Plan of Care & Orders Develop & maintain patient's interdisciplinary POC & physician orders. Reviewed by physician & signed if required. Care Plan Update with Patient/Family LTPAC interdisciplinary team updates to patient & family POC. Care Management/ Community Care Team Meetings Regularly scheduled care management meetings between all care managers including LTPAC providers (e.g., primary care managers for PCMH, hospital case managers, CCT managers, LTPAC care managers). Transmission of telehealth data from patient Transmit telehealth data each day from patient home to telehealth nurse for monitoring and/or followup. Electronic transmission from telehealth device to base station to cloud-based application. Routine physician order review & recertification Regular review & update of physician orders, home care POC/recertification, and/or therapy recertification. Change in condition/status update and/or order change request to attending physician Change in condition, status updates with or without order changes. Nursing and/or therapist to physician. Physician signature for order changes. Communicate Physician Orders changes to pharmacy & order medications (SNF & hospice) Communicate order changes & medications to pharmacy as applicable to setting. Pharmacy printing & delivery of monthly physician order recap, medication & treatment administration records When pharmacy provides the patient's monthly physician order recap, MAR & treatment record forms to LTPAC providers (e.g., SNFs), the forms are sent at the end of each month for the next month. Change in Condition/Status update to Patient/ Family/Caregiver Change in condition, status updates & order changes communicated to patient and/or family/ caregiver. Ongoing physician visits/evaluation (SNF) MD/NP visit facility patient for regular scheduled visits & as needed to meet medical needs of patient. Electronic access to Rush EHR as needed. Specialist visit/evaluation (SNF) Specialist visit (surgeon, neurologist, dentist, psychologist, etc.). Order changes for lab, radiology & special tests & return of test results Request new lab or radiology/ ultrasound or other specialized test & return of results. Referral to Community Care Team (home care if available) Referral to CCT if patient is not meeting goals & additional services are needed. Electronic submission of mandatory data sets which includes quality measures Submission of mandatory assessment data sets which includes CMS required quality measure data. ACO Measures ACO required measure reporting from all ACO partner organization whether (both affiliated & non-affiliated organizations). Public health & state registries for reportable conditions Reportable event data such as immunization data to public health authority as required. Elder Abuse Reporting Required elder abuse reporting if concerns identified. Eligibility Determinations with Payer Eligibility determinations & utilization review for Medicaid through HIEO, accesses state Medicaid provider database & patient database. Portals. MMIS. Communication with Payer Case Manager LTPAC clinical liaison provides updates to payers regarding initial & continued coverage. Communication with Patient/ Representative of Medicare Coverage Ending LTPAC provider liaison notifies the patient/ representative in writing with the Medicare end of coverage date & reason along with their appeal options. Telephone and/or in-person discussions may occur to understand the coverage decisions. Letter notifying patient/ representative that Medicare coverage will end, reasons & appeal process. LTPAC liaison (e.g., Medicare Nurse) to Patient/Representative notifying them of coverage ending date & reason. OMB Standards for Maintaining, Collecting, & Presenting Federal Data on Race & Ethnicity, Statistical Policy Directive No. 15, October 30, 1997. This template defines constraints that represent common administrative & demographic concepts for US Realm CDA documents. Further specification, such as documentCode, are provided in document templates that conform to this template. CCDA & several vocabulary standards. The procedures performed, as applicable. The care, treatment, & services provided. The patient's condition & disposition at discharge. Information provided to the patient & family. The CCD represents a core data set of the most relevant administrative, demographic, & clinical information facts about a patient's health care, covering 1 or more health care encounters. It provides a means for 1 health care practitioner, system, or setting to aggregate all of the pertinent data about a patient & forward it to another to support the continuity of care. The primary use case for the CCD is to provide a snapshot in time containing the germane clinical, demographic, & administrative data for a specific patient. More specific use cases, such as a Discharge Summary or Progress Note, are available as alternative documents in this guide. This document describes constraints on the CDA header & body elements for a Transfer Summary. 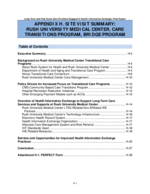 The Transfer summary standardizes critical information for exchange of information between providers of care when a patient moves between health care settings. Standardization of information used in this form will promote interoperability; create information suitable for reuse in quality measurement, public health, research, & for reimbursement. Consultation Note is generated as a result of a request from a clinician for an opinion or advice from another clinician. Consultations involve face-to-face time with the patient or may fall under the guidelines for tele-medicine visits. A consultation note includes the reason for the referral, history of present illness, physical examination, & decision-making component (Assessment & Plan). This clinical document communicates pertinent patient information to the consulting provider from a referring provider. 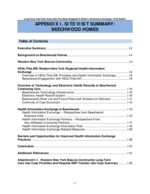 The information in this document would include the reason for the referral & additional medical information that would augment care delivery. Examples of referral situations are when a patient is referred from a family physician to a cardiologist for followup for a cardiac condition or a when patient is sent by a primary care provider to an ED. This template represents a patient's clinical status during a hospitalization or outpatient visit; thus, it is associated with an encounter. Taber's medical dictionary defines a Progress Note as "An ongoing record of a patient's illness & treatment. Physicians, nurses, consultants, & therapists record their notes concerning the progress or lack of progress made by the patient between the time of the previous note & the most recent note." Mosby's medical dictionary defines a Progress Note as "Notes made by a nurse, physician, social worker, physical therapist, & other health care professionals that describe the patient's condition & the treatment given or planned." Patient Summary record may include care plan fields, including: goals & instructions. In addition, the 2014 rule requires that the following information be exchanged (if known) as part of transitions & referrals in care: care team, including primary care provider of record & any additional known care team members beyond the referring & transitioning provider. A Care Plan is a consensus-driven dynamic plan that represents all of a patient's & Care Team Members' prioritized concerns, goals, & planned interventions. It serves as a blueprint shared by all Care Team Members, including the patient, to guide the Care Team Members (including Patients, their caregivers, providers & patient's care. A Care Plan integrates multiple interventions proposed by multiple providers & disciplines for multiple conditions. A Care Plan represents 1 or more POC(s) & serves to reconcile & resolve conflicts between the various POCs developed for a specific patient by different providers. While both a POC & a care plan include the patient's life goals & require Care Team Members (including patients) to prioritize goals & interventions, the reconciliation process becomes more complex as the number of POCs increases. The Care Plan also serves to enable LCC. The CDA Care Plan represents an instance of this dynamic Care Plan at a point in time. The CDA document itself is NOT dynamic. Provides the ability to identify patient & provider priorities with each act. Provides a header participant to indicate occurrences of Care Plan review. 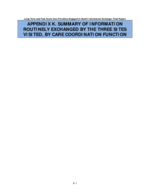 Please see: Appendix E in Volume 1 of this guide to view Care Plan Relationship Diagrams & story board. Health Status Evaluations/Outcomes Section (New). Certification prohibits use of the "unstructured document" document-level template (in the CCDA). Procedure Note encompasses many types of non-operative procedures including interventional cardiology, gastrointestinal endoscopy, osteopathic manipulation, & many other specialty fields. 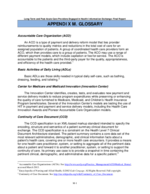 Procedure Notes are differentiated from Operative Notes because they do not involve incision or excision as the primary act. The Procedure Note is created immediately following a non-operative procedure & records the indications for the procedure &, when applicable, post-procedure diagnosis, pertinent events of the procedure, & the patient's tolerance of the procedure. The document should be sufficiently detailed to justify the procedure, describe the course of the procedure, & provide continuity of care. This section describes all interventional, surgical, diagnostic, or therapeutic procedures or treatments pertinent to the patient historically at the time the document is generated. The section should include notable procedures, but can contain all procedures for the period of time being summarized. 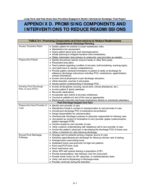 The common notion of "procedure" is broader than that specified by the HL7 Version 3 RIM, therefore this section contains procedure templates represented with 3 RIM classes: Act, Observation, & Procedure. Procedure act is for procedures that alter the physical condition of a patient (e.g., splenectomy). Observation act is for procedures that result in new information about a patient but do not cause physical alteration (e.g., EEG). Act is for all other types of procedures (e.g., dressing change). The length of an encounter is documented in the documentationOf/encompassingEncounter/ effectiveTime & length of service in documentationOf/ ServiceEvent/effectiveTime. This section contains the results of observations generated by laboratories, imaging & other procedures. The scope includes observations of hematology, chemistry, serology, virology, toxicology, microbiology, plain x-ray, ultrasound, CT, MRI, angiography, echocardiography, nuclear medicine, pathology, & procedure observations. This section often includes notable results such as abnormal values or relevant trends. It can contain all results for the period of time being documented. Laboratory results are typically generated by laboratories providing analytic services in areas such as chemistry, hematology, serology, histology, cytology, anatomic pathology, microbiology, and/or virology. These observations are based on analysis of specimens obtained from the patient & submitted to the laboratory. Imaging results are typically generated by a clinician reviewing the output of an imaging procedure, such as where a cardiologist reports the left ventricular ejection fraction based on the review of a cardiac echocardiogram. Procedure results are typically generated by a clinician to provide more granular information about component observations made during a procedure, such as where a gastroenterologist reports the size of a polyp observed during a colonoscopy. The Results section contains observations of results generated by laboratories, imaging procedures, & other procedures. These coded result observations are contained within a Results Organizer in the Results Section. The scope includes observations such as hematology, chemistry, serology, virology, toxicology, microbiology, plain x-ray, ultrasound, CT, MRI, angiography, echocardiography, nuclear medicine, pathology, & procedure observations. The section often includes notable results such as abnormal values or relevant trends, & could contain all results for the period of time being documented. Other health problems & their manifestations. The Health Concerns section contains data that describes an interest or worry about a health state or process that has the potential to require attention, intervention or management. Note: The 2014 Edition does not require use of any specific vocabulary set, but ONC has previously considered comments recommending the 3 vocabularies above. The Vital Signs section contains relevant vital signs for the context & use case of the document type, such as blood pressure, heart rate, respiratory rate, height, weight, BMI, head circumference, pulse oximetry, temperature, & body surface area. The section should include notable vital signs such as the most recent, maximum and/or minimum, baseline, or relevant trends. 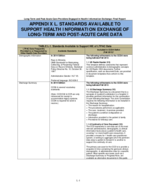 This section contains data defining the patient's advance directives & any reference to supporting documentation, including living wills, health care proxies, & CPR & resuscitation status. If the referenced documents are available, they can be included in the CCD exchange package. The most recent directives are required, if known, & should be listed in as much detail as possible. This section differentiates between "advance directives" & "advance directive documents". The former is the directions to be followed whereas the latter refers to a legal document containing those directions. This section contains data defining the patient's advance directives & any reference to supporting documentation. The most recent & up-to-date directives are required, if known, & should be listed in as much detail as possible. This section contains data such as the existence of living wills, health care proxies, & CPR & resuscitation status. If referenced documents are available, they can be included in the CCD exchange package. Structured Advance Directives including but not limited to, Intubation & Ventilation, Medications, Antibiotics treatment are represented using Advance Directive Observation template(s). Advance Directive Organizers are used to group the observations for each type of Advance Directive by type (e.g., 1 Organizer for Medications, & 1 for Resuscitation). NOTE: The descriptions in this section differentiate between "advance directives" & "advance directive documents". The former are the directions whereas the latter are legal documents containing those directions. Thus, an advance directive might be "no cardiopulmonary resuscitation", & this directive might be stated in a legal advance directive document. SNOMED CT for Allergy/Adverse Event Type Value Set (e.g., allergies to: substance, drug, food, dander, propensity to adverse reactions). This section lists & describes any medication allergies, adverse reactions, idiosyncratic reactions, anaphylaxis/anaphylactoid reactions to food items, & metabolic variations or adverse reactions/allergies to other substances (such as latex, iodine, tape adhesives). At a minimum, it should list currently active & any relevant historical allergies & adverse reactions. Both Sections 2.2 & 2.2.1 contain "Allergy Concern Act"
Patient Summary Record to include cognitive status if known. CCDA includes standards to represent cognitive & functional status using LOINC/SNOMED-CT/ICF. The Mental Status Section contains observation & evaluations related to patient's psychological & mental competency & deficits including cognitive functioning (e.g., mood, anxiety, perceptual disturbances) & cognitive ability (e.g., concentration, intellect, visual-spatial perception). Patient Summary Record to include functional status if known. CCDA includes standards to represent cognitive & functional status (ADL & IADL) using LOINC/ SNOMED-CT/ ICF. The Functional Status Section contains observations & assessments of a patient's physical abilities. A patient's functional status may include information regarding the patient's general function such as ambulation, ability to perform ADLs (e.g., bathing, dressing, feeding, grooming) or IADLs (e.g., shopping, using a telephone, balancing a check book). Problems that impact function (e.g., dyspnea, dysphagia) can be contained in the section. The Medications Section contains a patient's current medications & pertinent medication history. At a minimum, the currently active medications are listed. An entire medication history is an option. The section can describe a patient's prescription & dispense history & information about intended drug monitoring. This section requires either an entry indicating the subject is not known to be on any medications or entries summarizing the subject's medications. HL7 2.5.1 & HL7 2.5.1 Implementation Guide for Immunization Messaging Release 1.4. Electronic submission to public health agencies for surveillance or reporting. §170.205 (d)(3) PHIN Messaging Guide for Syndromic Surveillance (incorporated by reference in §170.299) & Conformance Clarification for EHR Certification of Electronic Syndromic Surveillance, Addendum to PHIN Messaging Guide for Syndromic Surveillance (incorporated by reference in §170.299). The Immunizations section defines a patient's current immunization status & pertinent immunization history. The primary use case for the Immunization section is to enable communication of a patient's immunization status. The section should include current immunization status, & may contain the entire immunization history that is relevant to the period of time being summarized. NCPDP SCRIPT Standard, Implementation Guide, Version 10.6, & RxNorm. HL7 Standard Code Set CVX--Vaccines Administered. A medication activity describes substance administrations that have actually occurred (e.g., pills ingested or injections given) or are intended to occur (e.g., "take 2 tablets twice a day for the next 10 days"). Medication activities in "INT" mood are reflections of what a clinician intends a patient to be taking. For example, a clinician may intend for a patient to be administered Lisinopril 20mg PO for blood pressure control. However, what was actually administered was Lisinopril 10mg. In the latter case, the Medication activities in the "EVN" mood would reflect actual use. This template records the act of supplying medications (i.e., dispensing). A medication should be recorded as a pre-coordinated ingredient + strength + dose form (e.g., "metoprolol 25mg tablet", "amoxicillin 400mg/ 5mL suspension") where possible. This includes RxNorm codes whose Term Type is SCD, SBD, GPCK, BPCK. NOTE: The dose (doseQuantity) represents how many of the consumables are to be administered at each administration event. As a result, the dose is always relative to the consumable. Thus, a patient consuming a single "metoprolol 25mg tablet" per administration will have a doseQuantity of "1", whereas a patient consuming "metoprolol" will have a dose of "25mg". Value Set: Medication Clinical Drug 2.16.840.1.113762.1.4.1010.4 All prescribable medication formulations represented using either a "generic" or "brand-specific" concept. This includes RxNorm codes whose Term Type is SCD, SBD, GPCK, BPCK, SCDG, SBDG, SCDF, or SBDF. Value set intentionally defined as a GROUPING made up of: Value Set: Medication Clinical General Drug (2.16.840.1.113883.3.88.12.80.17) (RxNorm Generic Drugs); Value Set: Medication Clinical Brand-specific Drug (2.16.840.1.113762.1.4.1010.5) (RxNorm Branded Drugs). Transfer of Care to Hospital. The general category of the patient's directive is documented in the observation/code element. The observation/value element contains the detailed patient directive which may be coded or text. For example, a category directive may be antibiotics, & the details would be intravenous antibiotics only. The Cognitive Abilities Observation represents a patient's ability to perform specific cognitive tasks (e.g., ability to plan, logical sequencing ability, ability to think abstractly). This template represents a patient's cognitive status (e.g., mood, memory, ability to make decisions) & problems that limit cognition (e.g., amnesia, dementia, aggressive behavior). The template may include assessment scale observations, identify supporting caregivers, & provide information about non-medicinal supplies. This template groups related cognitive status observations into categories. This organizer template may be used to group questions in a PHQ. This template represents the patient's physical function (e.g., mobility status, ADLs, self-care status) & problems that limit function (dyspnea, dysphagia). The template may include assessment scale observations, identify supporting caregivers, & provide information about non-medicinal supplies. This template is used to represent physical or developmental function of all patient populations & is not limited to the long-term care population. An assessment scale is a collection of observations that together yield a summary evaluation of a particular condition. Examples include the Braden Scale (assesses pressure ulcer risk), APACHE Score (estimates mortality in critically ill patients), Mini-Mental Status Exam (assesses cognitive function), APGAR Score (assesses the health of a newborn), & Glasgow Coma Scale (assesses coma & impaired consciousness). (a) Encryption & decryption of electronic health information--(1) General. Any encryption algorithm identified by the NIST as an approved security function in Annex A of the FIPS Publication 140-2, (January 27, 2010) (incorporated by reference in §170.299). (b) Record actions related to electronic health information. The date, time, patient identification, & user identification must be recorded when electronic health information is created, modified, accessed, or deleted; & an indication of which action(s) occurred & by whom must also be recorded. (c) Verification that electronic health information has not been altered in transit. Standard. A hashing algorithm with a security strength equal to or greater than SHA-1 (as specified by the NIST in FIPS PUB 180-4 (March 2012)) must be used to verify that electronic health information has not been altered. (d) Record treatment, payment, & health care operations disclosures. The date, time, patient identification, user identification, & a description of the disclosure must be recorded for disclosures for treatment, payment, & health care operations, as these terms are defined at 45 CFR 164.501. (e) Record actions related to electronic health information, audit log status, & encryption of end-user devices. (1)(i) The audit log must record the information specified in sections 7.2 through 7.4, 7.6, & 7.7 of the standard specified at §170.210(h) when EHR technology is in use. (ii) The date & time must be recorded in accordance with the standard specified at §170.210(g). (2)(i) The audit log must record the information specified in sections 7.2 & 7.4 of the standard specified at §170.210(h) when the audit log status is changed. (ii) The date & time each action occurs in accordance with the standard specified at §170.210(g). (3) The audit log must record the information specified in sections 7.2 & 7.4 of the standard specified at §170.210(h) when the encryption status of electronic health information locally stored by EHR technology on end-user devices is changed. The date & time each action occurs in accordance with the standard specified at §170.210(g). (f) Encryption & hashing of electronic health information. Any encryption & hashing algorithm identified by the NIST as an approved security function in Annex A of the FIPS Publication 140-2 (incorporated by reference in §170.299). (g) Synchronized clocks. The date & time recorded utilize a system clock that has been synchronized following (RFC 1305) Network Time Protocol, (incorporated by reference in §170.299) or (RFC 5905) Network Time Protocol Version 4, (incorporated by reference in §170.299). (h) Audit log content. ASTM E2147-01(Reapproved 2009), (incorporated by reference in §170.299). NOTE: Some of the standards described will change as a result of ballot reconciliation.